Dr. William Witherspoon, co-author of the book Roadside Geology in Georgia is hosting free geology walks and talks during the month of June. William (Bill) Witherspoon has taught K-12 students and their teachers for over fifteen years at Fernbank Science Center, part of the DeKalb County (GA) School District. He was named the Georgia Outstanding Earth Science Teacher in 2007 by the National Association of Geoscience Teachers. He received his PhD in Geology from the University of Tennessee. 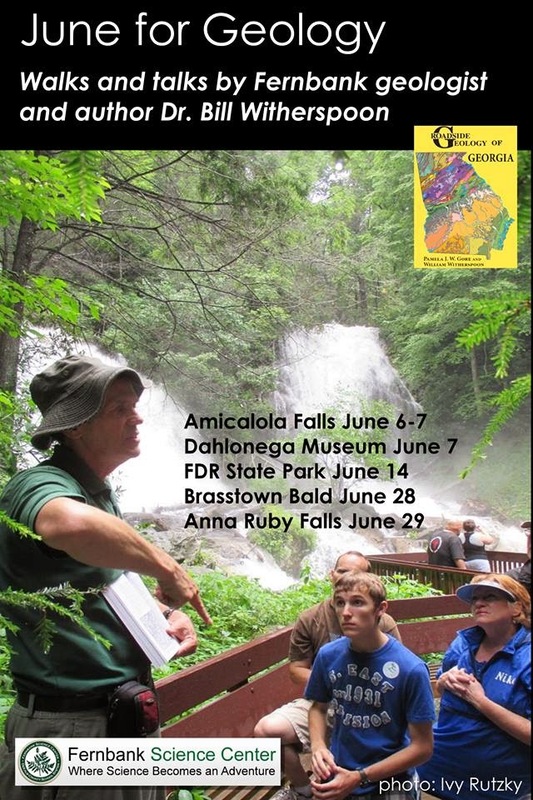 See www.georgiarocks.us/events for an overview of June geology walks and talks: They will be heading to lots of cool places like Amicalola Falls, Len Foote Hike Inn, Dahlonega Gold Museum, FDR State Park, Brasstown Bald, and Anna Ruby Falls - all great hangouts even if you are not learning the science behind the scenery. For two walks Dr. Witherspoon will be teaming up with Dr. Leslie Edwards of Georgia State U., first author of the gorgeous volume, Natural Communities of Georgia. These events are free and open to the public, but you may have to pay admission to the venues where they are being held. You can register for events simply by choosing "Join" at the event listing on Facebook, or by using the form on this page. Registering lets them know how many attendees to expect, and we will try to give each attendee who has registered a COOL BILLION-year-old rock or other cool Georgia item.